Location Data is exploding and it is driving innovation. But, beware! Understanding a sample of movement is not understanding how people move. Companies sell Location Data collected from smart phones, GPS probes and other such devices. Location Data can tell you where the sampled people are coming from and going to, when they are traveling and where they live and work. But Location Data by itself cannot answer the questions of “how many” and “how did they get there.” That’s because Location Data is collected from a segment of the overall population: users of an app, owners of a certain brand of car, or subscribers to a specific cell phone carrier and Location Data does not typically have enough location points to determine the route and mode of travel. Second, we build a logical view of the probable movement of total population using modeling techniques that we have developed over the last 30 years. 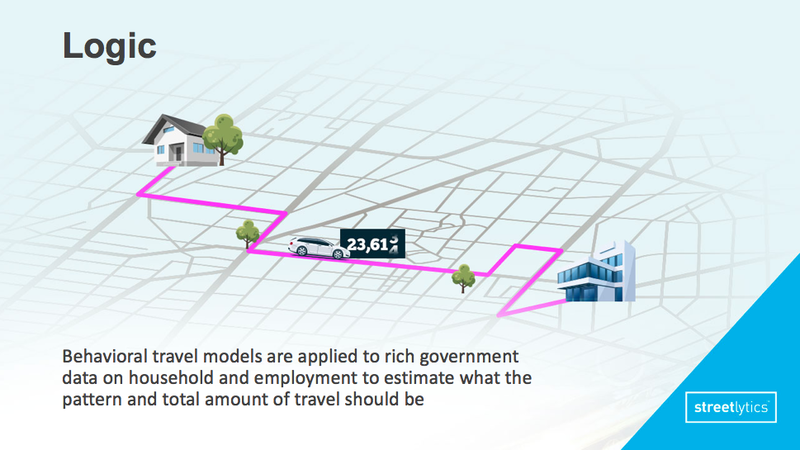 We apply predictive modeling algorithms, developed through the analysis of robust national and regional government travel surveys, to accurate, up-to-date household and employment data. These algorithms calculate “how many” trips are most likely to travel from each neighborhood to each neighborhood, what time of day those trips are most likely to occur and what mode of travel is most likely being used based on travel behavior captured in the travel surveys. For instance, if 500 households of a specific type live in this neighborhood, own these many cars, have access to a certain level of transit service, encounter a certain level of traffic congestion and have a certain number of shops nearby—we can determine ‘how many’ and ‘where’ those trips ‘should’ be occurring. This ‘logical view’ provides a rationality check in our weighting process and is completely independent of any source Location Data. Third, we collect all of the ground truth traffic counts available in each area. Traffic counts have been routinely gathered by governments for years. While these counts may not be perfect, as they are also samples, also weighted and are collected using a variety of techniques, they provide another independent view of “how many” vehicles and people are traveling on a region’s roadways. Knowing how many vehicles each roadway has historically served, including details about how the volumes vary by time of day, day of week, and during the course of a year, ensures that Streetlytics explicitly reflects local traffic dynamics.